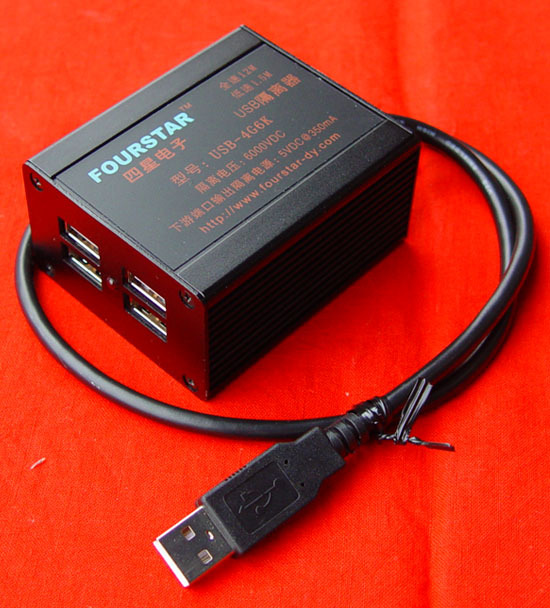 Deyang FOURSTAR Electronic Technology Co., Ltd.
USB (Universal Serial Port) is the most convenient brand new interface used most widely on computers at present. Its easy use and high speed promise it prominent advantages while compared with other interfaces. However, it is not originally designed for industrial application and there are potential interference and safety dangers or even catastrophic effects if it is applied in industrial automatic control and data acquisition, particularly to such industries with stricter requirements for safety as coal mining industry, chemical industry and medical industry. USB isolation measure is a method to eliminate the said potential dangers. The electric isolation of USB can eliminate the transient voltage or earth potential difference on the bus effectively, so as to avoid computer or equipment damages due to static electricity, lightning, power supply surge, or circulating current in ground wire, prevent incorrect data and ensure the safe isolation between the equipment at the underground dangerous occasions in mines and the external world, the safety of human bodies when it is used for medical purpose, etc. Industrial automatic control system, data acquisition system or some other systems transit data to computers through USB interfaces for data processing and control. However, the industrial equipment of the said systems is usually used in poor site conditions and therefore easy to be influenced by heavy current, high voltage or lightning strike. If the interface has no isolation function, the high voltage or heavy current surge on site will be very easy to be transmitted to computers through interface circuits, thus causing computer damage and system breakdown or even making the site out of control. It is necessary in data transmission between the underground equipment of mines with higher requirement for explosion prevention and the overground equipment to employ electric isolation and make it reach curtain isolation voltage grade, which has become a compulsive standard of each country. The first and most important thing to be considered in application of medical devices is the safety of human bodies. However, for some medical devices, their USB interfaces are connected with computers and it is necessary in data acquisition or treatment done for human bodies to make electric contract with human bodies. In order to avoid high-voltage electric shock to human bodies transmitted from computers, equipment and interface circuits in this case, the electric isolation of interface circuits is a key protection measure against high-voltage electric shock. The USB isolator independently developed by our company realizes direct physical electric isolation for USB interfaces with help of brand new interface circuit and high-speed isolating device. Meanwhile, it makes sure that the signals after isolation are still in line with code USB2.0. In a bid to meet the application requirements in different industries, our USB isolators include two types, i.e. USB-4G3K with an isolation voltage of 3000VDC and USB-4G6K with an isolation voltage of 6000VDC. Only differing in isolation voltage, the isolators of the two types are completely the same in other properties and, after isolation, their downstream USB ports both have four USB interfaces. 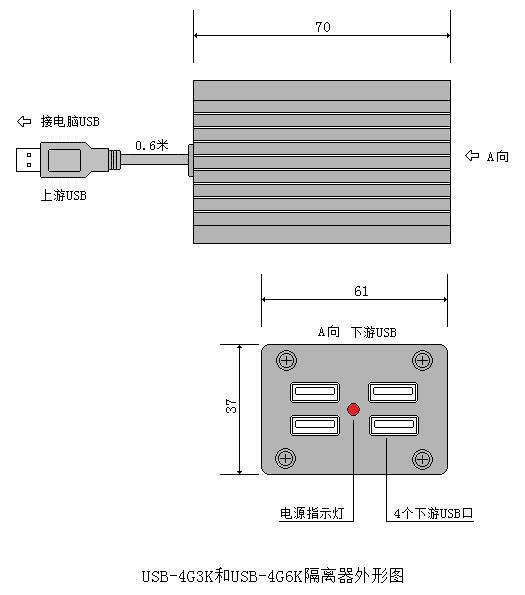 User may connect a USB HUB with the downstream port of isolator of either type to realize isolation for multiple pieces of downstream equipment. ● Isolation voltage between upstream port and downstream port: 3000VDC (model: USB-4G3K) or 6000VDC (model: USB-4G6K). ● Consisting of one upstream USB interface and four downstream USB interfaces. ● Supporting 12Mbps full-speed USB transmission and 1.5Mbps low-speed USB transmission and is compatible with USB V2.0. ● Automatic recognition of automatic recognition of USB High-Speed and USB Full-Speed or USB Low-Speed. ● Supporting USB control transmission, bulk transmission, interrupts transmission, synchronous / isochronous transmission. ● Power supply source: supplied via the USB interface of the host. ● The output isolating source of the downstream USB ports after isolation: 5VDC @ 350mA (the maximum total output current of the four downstream USB interfaces). ● All upstream and downstream USB ports are provided with a surge protector. Insert the upstream USB cable of the USB isolator into the USB interface of the host to obtain power via the USB interface. The downstream four USB interfaces are isolated and can provide a maximum total output current of 5VDC 350mA. So, the electric power demand of most USB devices can be satisfied thoroughly. Hereunder is the outside view of the USB isolator. After isolation by the USB isolator, the 5VDC power supply outputted via the USB interface of the host can provide a maximum current of 350mA which can satisfy the electric power demand of most USB devices. But for devices with larger electric power consumption (5VDC, 2A in general) and with electric power provided via a USB interface, such as USB hard disk and USB CD-ROM, the 5VDC power supply will possibly fail to provide enough electric energy to make them work normally. It is necessary at this time to plug a commercially available USB HUB with an external power supply onto the downstream USB socket of the USB isolator first and inert the device into the USB HUB then. The external power supply of the USB HUB then can provide electric power. Also, the voltage of the 5VDC power supply outputted from the USB isolator will decline and the operations of the USB devices are likely to become unreliable, if the downstream interfaces are overloaded. It is also necessary at this time to plug a commercially available USB HUB with an external power supply onto the downstream USB socket of the USB isolator first and inert the device into the USB HUB then. The external power supply of the USB HUB then can provide electric power. 1. What are high-speed USB devices, full-speed USB devices and low-speed USB devices? Answer: High-speed USB devices transmit data at a speed of 480M, such as USB disks, USB hard disks, USB CD-ROM, etc. Full-speed USB devices transit data at a speed of 12M, such as USB printers, scanners, industrial control devices, etc. Low-speed USB devices transit data at a speed of 1.5M, such as USB mouses, card readers, USB keyboards, etc. 2. Why high-speed USB devices (such as USB disks and USB hard disks) have decreased speed of file reading or writing after being isolated by a USB isolator? Answer: After connected with a USB isolator, a high-speed USB device (480M) will has its speed decreased automatically to full speed (12M). That’s why it runs slower than the speed (480M) when it has not been inserted into the host’s USB interface. The signal isolation problem at a speed up to 480M cannot be solved at present. The USB high-speed isolation stated by some manufacturers in their product description is in fact automatic decrease to full speed too. 3. Why devices like USB printers, USB disks, industrial control devices, USB mousse and USB keyboards can all work normally after a USB isolator is used, but USB hard disks cannot work? Answer: It is because devices like USB printers, USB disks, industrial control devices, USB mousse and USB keyboards consume small electric power or don’t obtain electric power via a USB bus and the isolator’s output current can fully satisfy the electric power demand of the devices, but devices like USB hard disks and USB CD-ROM consume larger electric power (2A for a USB CD-ROM) and are provided with electric power via a USB interface, which makes the isolated power supply fail to provide the needed high current. The method to solve this problem is to plug a commercially available USB HUB with an external power supply onto the downstream USB socket of the USB isolator first and inert the device into the USB HUB then. The external power supply of the USB HUB then can provide electric power. 4. Is hot plugging is allowed? Answer: Our USB isolators allow hot plugging and are provided with surge protectors on all upstream and downstream USB interfaces. Answer: The reason is the poor compatibility of USB interface of the PC’s Motherboard. USB isolator is a pure hardware circuit, which has strict requirements for USB signal timing. The solution is to install a USB HUB, then insert the USB isolator into USB HUB.